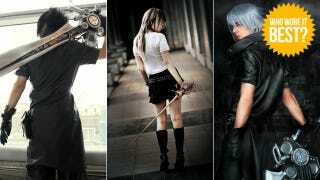 Where is Final Fantasy Versus XIII? It's right here in video game fandom, that's where. While Versus XIII was first announced ages ago, the game has yet to see release. During this long wait, the game's inability to hit shops hasn't stopped Final Fantasy fans from cosplaying as characters from the game. Guess that's a testament to how much fans are anticipating the title! In the images below, try to suss out which cosplayer did the best job of bringing Versus XIII to life and wonder what's taking Square Enix so darn long to do the same.